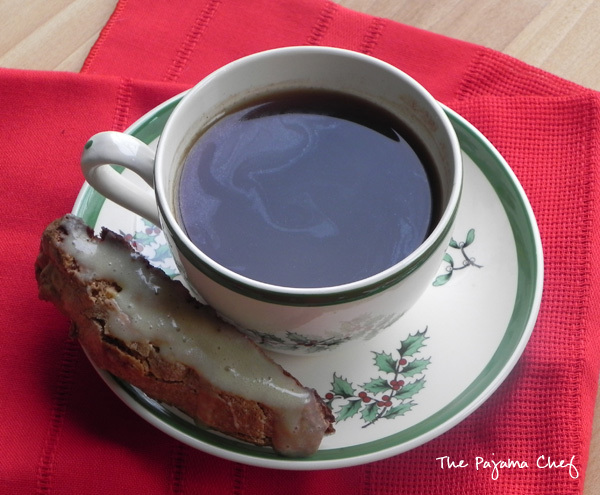 Delicious spiced biscotti with some holiday cheer in the eggnog glaze! Mmmm! These biscotti are made with three of the above ingredients: eggnog, nutmeg, and white chocolate. Let’s start with the biscotti: aside from allll the lovely spices like cinnamon, nutmeg, ginger, and cloves, I also added some sliced almonds and some chopped white chocolate. Tiny sliced almonds + chocolate = lotsa small pieces in each bite. Small pieces also makes slicing the biscotti easier after its initial bake. After the biscotti baked and cooled, I finished it off with a super simple eggnog glaze. It was just eggnog and powdered sugar. Easy as pie! 🙂 We have been enjoying our biscotti over the past week or so with coffee, tea, and even hot cocoa! They’re a fun treat to an already fun season. Hope you enjoy, and be sure to check out other recipes from this month’s edition of Mystery Dish! Preheat oven to 375 degrees F. Line a baking sheet with parchment paper or lightly grease. With an electric mixer, beat egg and sugar on medium speed for 2 minutes, until light and fluffy. Add in brandy and vanilla, beating to combine. In another bowl, whisk together flour, baking powder, cinnamon, nutmeg, ginger, and cloves. Slowly mix in flour mixture into egg mixture. Fold in almonds and white chocolate. Spoon batter onto baking sheet. With wet hands, shape into a 2 by 10 inch log. Bake for 20 minutes, until golden brown, then remove from oven and let cool for 15 minutes. Transfer biscotti to a cutting board and slice into 1/3 inch pieces. Return pieces to baking sheet, then bake for 10 minutes. Flip and bake for another 8-10 minutes. Remove from oven. Biscotti will continue to harden as it cools. When cool, whisk together powdered sugar and eggnog in a small bowl. 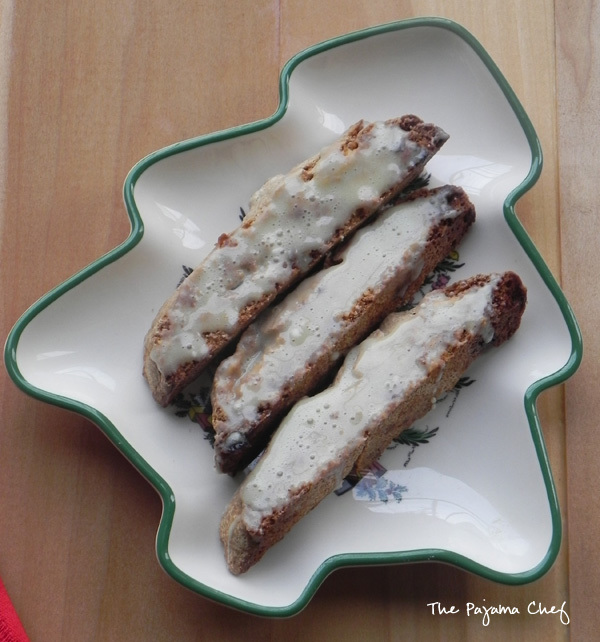 Brush or drizzle onto biscotti and let glaze set. When set, brush or drizzle on a second layer if desired. Check out what else my Mystery Dish pals made this month! Previous post50 Christmas Cookie Plate Ideas: Cookies, Candy, and More! Yum! 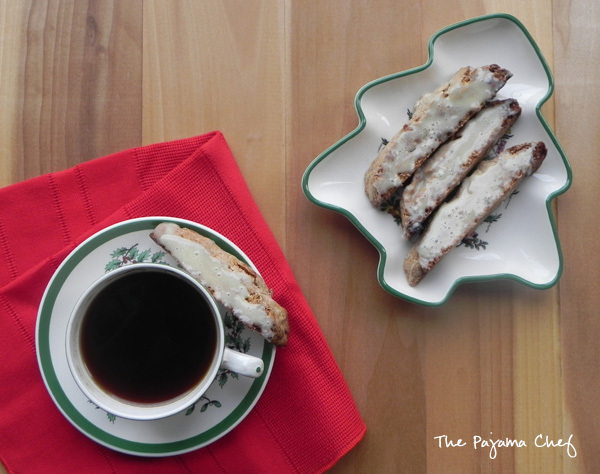 I’ve never had biscotti with a glaze before- that’s something I’ll have to try! Sarah, I’ve never tried a biscotti, period… I think I need to get out more! But, I’m all inspired with your amazing eggnog creation. The whole thing is calling my name! Yum!! 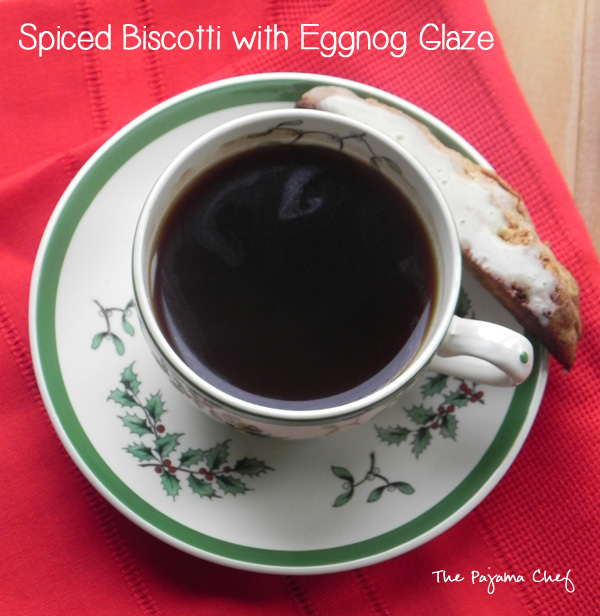 Eggnog glaze sounds just perfect on this biscotti! Eggnog and white chocolate sound great together!! I hope you are enjoying the relaxing week! These look like a delicious holiday treat and a great way to use up leftover eggnog! Enjoy the rest of your vacation and relaxing. We are doing the same thing this week! Happy New Year! thank you, amy! happy new year! I can’t help but notice your Spode! My mom collects that. She’s going to need to build a closet to store it all pretty soon. I’d prefer a closet-ful of this biscotti. I can’t resist anything eggnog flavored! Biscotti and coffee—-yum. I love eggnog. This glaze is inspired! I have to give you a gold star for this one.